Once again, it has been a couple of months since I last updated the website/blog, but if you have been following along with me on Instagram or Facebook you will know that this week I released the pattern I have been working on for... well, most of the year! 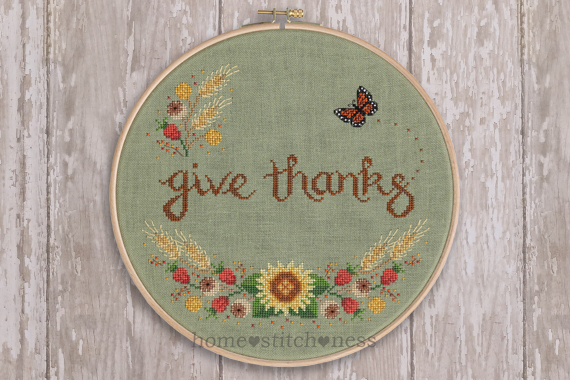 I am excited to introduce my late summer/autumn inspired design 'Give Thanks'. The phrase 'Give Thanks' is a sentiment that means a lot to me and is something I try to remind myself to do on a daily basis. 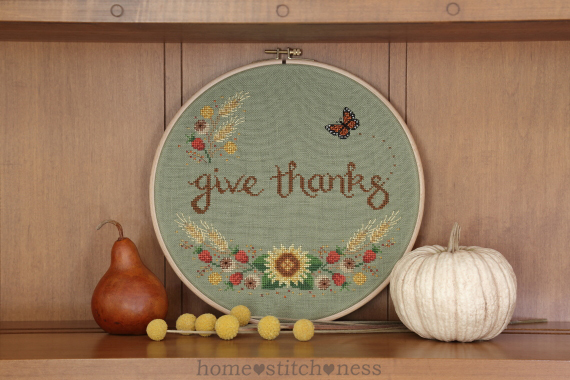 For this design, I knew I wanted to stitch a floral garland with a prominent sunflower and the colours I chose seemed to lead me in the direction of an autumn harvest theme, with lots of red, orange, gold and brown threads used. Also, I could not resist including another little monarch butterfly to the design, as well - it was such a popular addition to my 'Summer Garland' pattern that it deserved to be featured again!